The last time I had a “normal job” was in 2008. Maybe you remember that year. There was a spectacular market crash in October, followed by a prolonged, painful buckling of the global economy. Lots of hyperventilation and money stress going on, pretty much all over the world. The company I was working for was going through round after round of layoffs. I had a three-year-old, and I was the primary breadwinner in my house. That’s the kind of stress that wakes you up every morning at 4:00 a.m. feeling like you can hardly breathe. I had a decision to make: Should I quit on my own terms and go freelance, or should I wait for them to push me out? Even though I was really, really freaked out, I jumped. I turned in my resignation. I set myself up as a freelancer. And I did a lot of that “build the plane while you’re flying” thing. I really think I would have crashed and burned if I hadn’t had a group of supportive friends to help me figure out all of the “non-obvious” stuff. Now in retrospect, quitting back then was absolutely the smartest thing to do. It gave me real security, instead of the fake security that comes from a day job. It let me protect my confidence by avoiding the layoff. And it’s opened all kinds of fascinating doors, including my eventual partnership with Brian Clark here at Copyblogger. But I have never forgotten what it felt like to be waaaay out on a limb like that. And 10 years later, one of the things that keeps me going is the chance to be another person’s “supportive friend” to help bridge the gaps. So you may be feeling like you don’t have your stuff together for Certification yet. You aren’t experienced enough, your website isn’t ready, you don’t feel like your portfolio is awesome, the thought of reaching out to clients still makes you a little nauseated. You don’t feel like a rock star, or a ninja, or any of those other success clichés. You’re peering over the edge of this scary-looking gap, and you’re just not sure you’re ready to jump it. And that is 100 percent normal. You don’t have to take any huge scary steps right now. Try Certification out. Spend some time thinking about what it will be like to see yourself on the Copyblogger list of recommended writers. If you try out the material and can’t see it working for you, we make it really easy to hit the “Undo” button. You’ve got 30 days to explore it for yourself. On the other hand, there isn’t an “Undo” button if you let the timer run out on this. I like to keep our list of recommended writers tight and focused, and we’re not planning on opening Certification again before late 2019. In the next year, if you just land one good new client a month, what will your work life look like? In the next year, if you bump your rates up to where they should be for a well-qualified, confident professional, what will your finances look like? In the next year, if you can say “Yes” to those juicy projects, the fascinating ones that call for a well-rounded strategic skill set, what will your confidence look like? 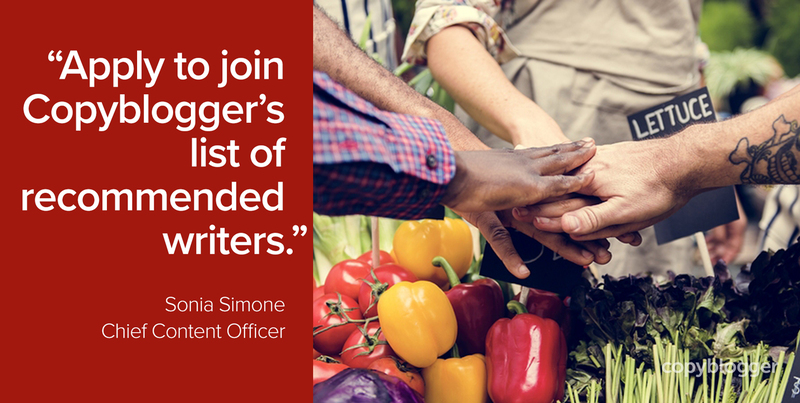 The Copyblogger team and I would love to be your “supportive friends” to show you the ropes. Let us help make you more visible, and get you the clients you deserve. It would be our pleasure to have you with us.